Boolean operations are mostly composed of multiple models flagged for addition or subtraction mode, stacked on top of each other in the SubTool list. Because of the way they are used, it can become difficult to visually understand what the final model will be like. 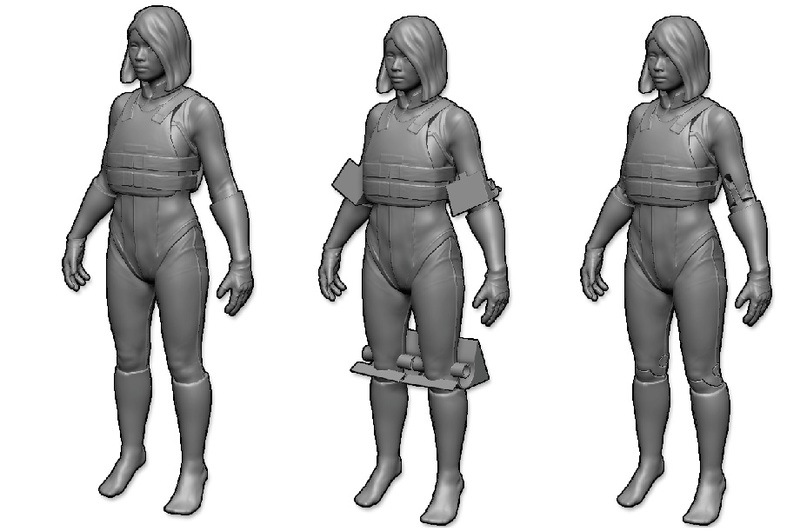 To resolve this common problem, ZBrush includes a Live Boolean mode which previews the result of the current Boolean commands as they would affect the final processed model. You can even modify the models, duplicate them, change ArrayMesh settings, sculpt and much more while still previewing the final Boolean result in real-time. The Live Boolean process in action with (from left to right): the original model, the added joint SubTools and the result. Model courtesy of Joseph Drust. Another example of a Live Boolean mesh with the original SubTools on the left and the preview of the Boolean process on the right. Model courtesy of Joseph Drust. Click Render >> Render Booleans >> Live Boolean mode to enable it. If none of your SubTools are set to subtraction or intersection mode, you shouldn’t see any difference until you enable one of these modes. Before processing the final model as a true 3D model, you must enable the Live Boolean mode. Both operations are tied together since you must be able to anticipate the resulting SubTool(s). When Live Boolean mode is on, the Tool >> SubTool >> Boolean >> Make Boolean Mesh function will be available.